Here at ABA, we are known for delivering high-quality filling machines and equipment to our customers. Our team puts quality first because we understand the importance of reliability and efficiency your business needs in order to meet and exceed production goals. Check out three reasons why you should turn to ABA for all your filling machine needs. Diverse Selection- Our vast inventory showcases a variety of filling machines including net weight, volumetric, automatic, semi-automatic, top fill, bottom fill, electronic, pneumatic, and more. All of the machines we manufacture are custom tailored to best suit the needs of our individual clients. 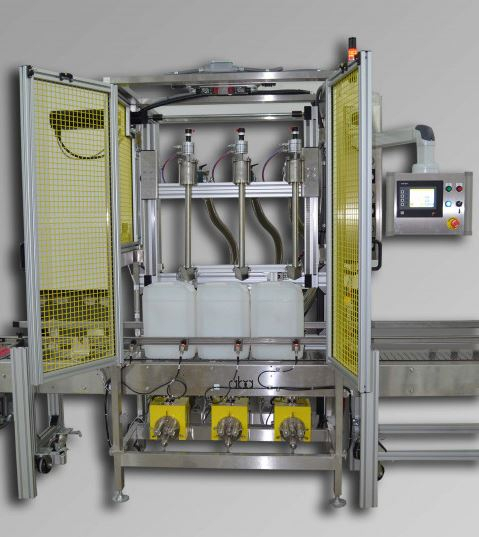 In order to create the best filling line or system for our customers, we also offer lid closing machines, rotary tables, volumetric pumps, fill heads, and more. Supply Various Industries- We supply many industries with filling machines and equipment, including the paint and chemicals industries, and our machines have filled a diverse array of products such as roof coatings, concrete sealants, automotive paints, vanilla extracts, and vegetable oil. Since we can fill both plastic and metal containers in a variety of sizes and shapes, the industry possibilities are endless. Purchase Parts from Us- At ABA we carry a large selection of spare parts for our filling machines and equipment. Browse our selection on the Parts section on our website. Our team will happily answer your questions surrounding our products and how we can customize to meet the specific needs of your industry. Give us a call at (803) 396-0621 to speak with one of our team members.